Most of you probably haven´t heard of The Man-Eating Tree yet but I am quite sure that this will change very soon because for me this band already belongs to the Nr.1 bands in the metal scene. With their music and emotional lyrics Vesa Rantas (Ex-Sentenced Drummers) new band surely will captivate each and every listener. The whole band plays with a passion that is nowadays only rarely seen. STALKER met Vesa and singer Tuomas Tuominen to introduce you to a band that has a bright future ahead. How did the band come about? Where did you meet in the first place? How long are you working together? 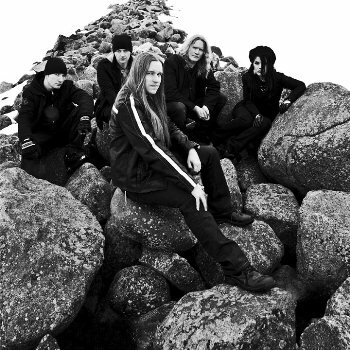 Tuomas The idea, or ideas of a band were brainstormed between Vesa and his friends, including Miika Tenkula, Janne Markus, Aaron Rantonen and Mikko Uusimaa. In the spring of 2009 some friendly acquaintance, a music fan himself, had heard rumors about a new band that was up until that point missing a singer. This mysterious benefactor then also discovered that I was currently searching for something more to do when it comes to music, and kindly hooked me up with Vesa. This happened not very much after Miika had passed away. I believe I was the missing piece in the puzzle. As soon as I decided that I would join a new band with these Northern musicians [the band is from the Northern Finnish town of Oulu], the band was formed. Heidi Määttä was confirmed as our keyboard player also around the same time. So The Man-Eating Tree has been in existence now for about a year. Of course Finland is a small country and the metal music scene is not so big that I wouldn´t have known most of my band mates before, if not by faces, then at least by their names. How did you come up with the band name „The Man Eating Tree?“ What´s the meaning behind it? Tuomas The band name was the idea of Aaron Rantonen, a friend of Vesa. He was fascinated by the myth of The Man-Eating Tree, brought to life by the early depictions of the early discoverers. I like to see this legend brought to this day, extend it´s meaning into how the modern mind can be similarly affected by legends brought to life by the media, how certain mindsets can be cultivated, if need be. How would you describe your own music? What can people expect from it? Tuomas I would describe it as atmospheric metal. Listeners can expect to hear not only the straightforward metal music but also great depths, as well as a certain fragility. There are moments in our music, when it is totally stripped down and vulnerable. Who writes the music/lyrics or is everyone in the band involved? 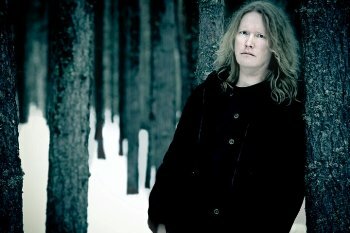 Tuomas Janne is in charge of the bulk of all compositions and brings in also some vocal melodies he has thought of in the process of writing the music. He brings them into the band house and everyone adds their own touch into the performance. I write most of the lyrics and also contribute most of the vocal arrangements. In every band info I read Vesa Ranta is mentioned first, how is it for the rest of you to somehow play the second fiddle? Tuomas Hee eh, I don´t feel that way. Vesa is the drummer, one part in a machine that cannot function without the other parts. Tuomas, can you tell us something about your musical background, which bands have you been in before, where did you learn to use your voice like that etc. Tuomas Of course! I was the lead singer of the band Fall of the Leafe for almost the entire career of the band. I have also visited the recording sessions of some of my friends like For Selena and Sin, as well as a band named Noumena. During these brief studio visits it may have occurred that my jokes, laughter, or even singing have been caught on tape. I am not an academically trained singer, if that is what you are referring to. I have learned to use my voice in the band house, in endless jam sessions with my friends. What do you think is the best/worst thing of being a musician in Finland? Tuomas The best thing is probably the abundance of good bands, musicians and above all, all the people who dig music! The single worst thing is probably the lack of proper places for bands to rehearse. Vesa, how is it for you to start again from scratch, after you have been in a band like Sentenced that achieved so much? Vesa Of course, the feeling is slightly bizarre – while at the same time it also felt good and fresh to start building a new band from nothing. However, thanks to our previous musical endeavours, we all also have a lot of contacts all over world, which will hopefully also help us ahead a little bit. We want to take The Man-Eating Tree further one step at a time and choose our partners carefully. We are investing a lot, in every way, into this band so it´s important that all our partners in crime also put their heart into what they do. All doors are now open and it feels all right. If you look back on Sentenced, do you regret the death of the band or are you still happy with the decision? Vesa The death of Sentenced was a carefully planned and executed decision. We do not regret it to this day. Sentenced started when we´re barely old enough to buy beer from the supermarket. From there on, the career lasted for 16 years. At the end, we were all at a point in our personal lives where full time band life didn´t seem like the best possible option. Of course, Sentenced could have grown even bigger if we had had the will to go on touring for a few years longer. But there is no real need to speculate on this because inside the band the state of mind was that the journey had come to an end with style. Most of you guys didn´t want to make music again, what changed your mind? What was the reason that you wanted to be in a band again? Vesa For me it took over a year to get excited about playing again - and to get excited about new music in the first place. I found bands, new to me, that expanded my musical horizons. For example Opeth, Porcupine Tree, and Tool were all bands that sounded interesting and fresh to me. 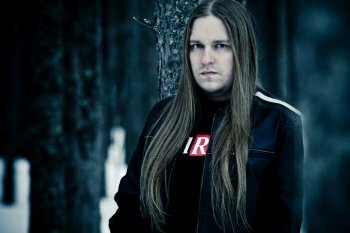 However, the final contributing factor behind the decision to establish a new band was the discovery of Tuomas Tuominen. Miika Tenkula and I had been searching for a soulful singer for a long time already. And when I heard Tuomas´ voice, I was at that instant certain that this is the sound we have been missing. What did you miss the most after Sentenced had broken up? Vesa Of course, the fine shows and old friends we had been through so much over the years. Because we were always so much together in all things related to Sentenced, we were not so much in touch when the band was inactive. I could say that I miss the team. What do you think about the bands of your ex-band mates like Kypck, Poisonblack or The Black League? Vesa I like all of these bands. All of them have their own style. Out of all of these, I consider KYPCK to be my cup of tea. It is so out-of-the-box and unique. It´s a brilliant idea to play relentless doom metal in Russian. I remember visiting their studio sessions - walked in the door with the preconception that it would be a bit of a joke or something less serious anyway. Walked out of the door completely blown away. I like the fact that all members of Sentenced have found the passion to make music again. I have sometimes played with the thought of what would happen if KYPCK, Poisonblack, and The Man-Eating Tree would tour together. It might end up in something completely different. Now after the gig I can ask: How was it for you to play your songs to an audience for the first time? Tuomas Scary as hell was the feeling right before getting on stage. But this feeling lifted off at the first chord. Then it was all just a breeze. Cannot remember anything of it between the first and last chord. This is one of my problems - I get carried away whenever delivering our music. I hope it´s a good thing! Do you have some last words for our readers? Tuomas Take care and make sure to check out The Man-Eating Tree! Thank you for the interview!